I've been using Herbal Essence Conditioner for several months now, and I've been very pleased with the way it leaves my hair. I have very long, thick, and naturally wavy hair, and it's always been difficult to find a conditioner that makes it easy for me to comb through my wet hair. This conditioner is the one that has finally made it quick and easy to comb through my long hair. In addition, the smell of this conditioner in the shower is very good and makes me very happy. I don't have to use very much of this conditioner, so a bottle goes a long way. This conditioner is priced very well, and very often I find it on sale at the local grocery store or even at the national drug store chains. There are usually coupons in the Sunday ad section, online to print on your computer, or tear pads at the stores in the shampoo isle. I've finally found you don't need to spend a lot of money on your hair conditioner anymore. Effectiveness Great product! Scent Smells wonderful!! I am not a prissy girl. I don't do a lot of hair styling, or use a lot of hair styling products. I have long hair that is prone to frizzing, drying out on the ends, and being oily near the scalp. I have tried so many conditioners and conditioning products trying to find the perfect fit. What finally ended my search was a bottle of Herbal Essences Conditioner. First of all, the scents are amazing. I haven't found an Herbal Essence Conditioner yet that hasn't smelled amazing. Sure, some conditioners smell good in the bottle but by the time your hair is dry, that great scent is gone. Not so with Herbal Essences Conditioners. The great scent lasts throughout your day. Secondly, the level of conditioning is just right. It's not too much which weighs my hair down and causes it to feel limp and greasy. It's not too little, which causes my ends to be dry and brittle, and makes my frizzing problem worse. It's the perfect balance. Lastly, the price is right. Herbal Essence Conditioners are every bit as effective as salon products, but for a fraction of the cost. And you can find Herbal Essences Conditioners at almost any store. My hair has never felt so soft, silky and smooth. Not the same as it was! I was in love with Herbal Essences products in high school, so last year I picked up a bottle of the conditioner when I was feeling nostalgic. The brand was priced fairly middle of the road- more expensive than the super cheap brands like VO5, but definitely less than the salon level brands they sell in stores. The first thing I noticed was that the bottles were completely different from what I remembered. They definitely updated the packaging to make it much more "modern". I noticed that none of the scents were the same either. I figured it was no big deal though, I was sure the conditioner would give me the same soft and shiny hair I remembered, it would just smell different. Unfortunately, I was wrong. Once I got in the shower and had rinsed out my shampoo, I noticed right away that the conditioner was definitely thinner than I remembered, it almost felt watered down. I had to use a lot in my hair to get it completely covered, much more than the other conditioners I currently use. Once I left it in for three minutes, I rinsed it out. There were only a couple minor tangles, not too bad. After I got out of the shower and dried and styled my hair it was incredibly flat, lifeless, and dull. Nothing like I expected. Hoping it was just a fluke, I gave the conditioner a few more chances, but the results never improved. I'm sad to say my Herbal Essences days are definitely long over! I think very highly of the conditioners this brand makes. I have tried almost every one of them and have never been let down. It is truly a quality conditioner. It is very well priced as well. You definitely get a high quality considering what you pay for it. It has always worked really well to moisturize my hair. I have also never experienced any kind of damage to my hair while using this conditioner. I would highly recommend trying out Herbal Essences conditioner. I have never been disappointed by it. Effectiveness I have found this conditioner is always effective. It always works to moisturize my hair. Each different type caters to a different need. Each conditioner I have used has done what it promised to do. I would say they are highly effective conditioners and a highly effective brand. Scent I love the scent of each conditioner I have used by Herbal Essences. I think this brand does a great job at creating great and unique scents. They also stay in your hair through out the day. Smells amazing and conditions every strand. With Herbal Essences I always feel soft and smooth and shiny and confident. The conditioners are so thick and rich that I know as I'm applying that my hair is being deeply conditioned. The conditioner penetrates every strand of hair and is great for short or long hair and honestly any type of hair from fine, color treated, curly, or straight. The conditioner goes to work immediately. As I am applying it in my hair, my fingers can slide through my hair without getting tangled or caught so it instantly starts to detangle. The scent of these are wonderful. The entire time you're shampooing or conditioning, the smell is in the shower and leaves your hair and the entire room smelling great. These rinse out so well. I don't feel like I have to rinse my hair for minutes on end, wasting my time and my water. They also aren't heavy so if I opt to air dry, blow dry, or use my wet to straight flat iron I don't feel like I'm left with product or grease in my hair. This product left me conditioned and with significantly less flyaways and frizz. I also believe it's helped seal split ends between hair trims. Effectiveness It gives you everything you want from softness, silkiness, shine, and moisture, to damage control and a safe conditioner for color treated or permed hair. Scent Love the scent. Very floral and fruity. Let me start off by saying that I am very picky when it comes to my hair conditioner. This is simply because I have extremely long, thick hair. It is not easy to keep up with, especially during and after showering. Many conditioners do not blend well with my hair - they do not soften my hair as they should. This causes my hair to become extremely dry, feeling like hay, even while it is still wet. Herbal Essences, however, is the perfect match! Not only does it soften my hair and make it manageable and easy to style, but it leaves it smelling delicious all the way up until my next shower. I stock up on the large bottles of Herbal Essences - the ones with the pump! That is how much I love this product. If it works for my thick, tough to deal with hair, it will most certainly work for yours! I recommend this product to people of all hair types. 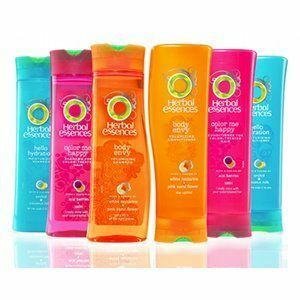 Herbal Essences Conditioners offers a large selection of conditioners that are designed for color treated hair, long hair, etc. 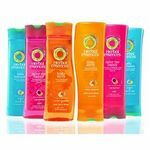 Each of these conditioners smells great, and they leave your hair very easy to brush thru. These also help keep my hair less frizzy than normal, which makes it easier to straiten. This helps keep my hair from drying out in the winter when it has a tendency to become dry and frizzy. I also love the fact that these conditioners are so affordable. I have a tendency to use a lot of conditioner because my hair is so long, and I don't feel guilty about having to buy this conditioner. Effectiveness These work great to get all of the knots out of my hair. It keeps my hair shiny, and I don't have to worry about it leaving my hair oily. Scent No matter what brand of Herbal Essences conditioner I choose, they always smell great. It's also good that they have so many selections of scents. If there is one I don't like, there are many other options of scents that I can choose from. I normally use the blue one for my dry and damaged hair. They have many different kinds though. I have used the one for color treated hair as well. Every time I have used this product I have never been unsatisfied. 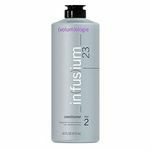 It works great and leaves your hair feeling clean, soft, smooth and gives your hair a very nice shine. Great conditioner for the money! Herbal Essences Conditioner is great in that you can't purchase it for a really low price, and still get great results from the product. I love that there is such a variety of conditioners and that I can practically pick my hair treatment. Frizz control, oil control, and moisturizing are just a few of the options they offer. I only wash my hair every other day or every three days and just use conditioner on my off wash days. This conditioner doesn't make my hair oily and it leaves it feeling clean and smooth all day. Each conditioner smells so delicious and keeps my hair smelling delicious all day too. I haven't had to worry about this conditioner making my hair feel filmy, oily, or dry, and I have at times used it for more than a month at a time. I love that I don't have to use to much to get great results, and a bottle lasts me a month at least. Great for the price! I would highly recommend this conditioner for all hair types!